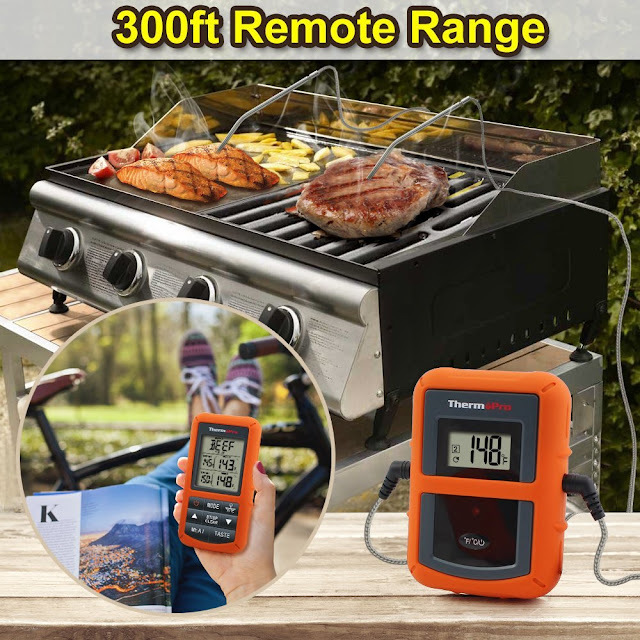 Thermopro tp20 wireless remote food thermometer is all about your desired cooking food temperature for your desired taste, quality and food safety and this will bring your grilling game to the next level. 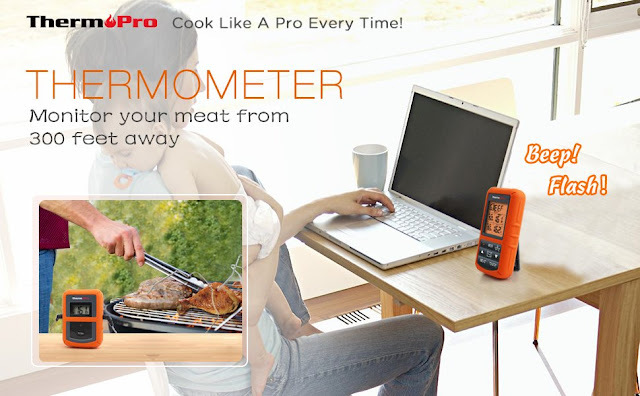 Thermopro tp20 is a wireless cooking digital thermometer that's actually the number one best seller on amazon for grill thermometers and has won the amazon's choice badge because of it's popularity amazon trust. You will receive transmitter and receiver with AAA batteries in the box. This thermometer comes with one year of warranty but if you register your product after purchase then you will get 3-years of extended warranty for thermopro tp20 thermometer. 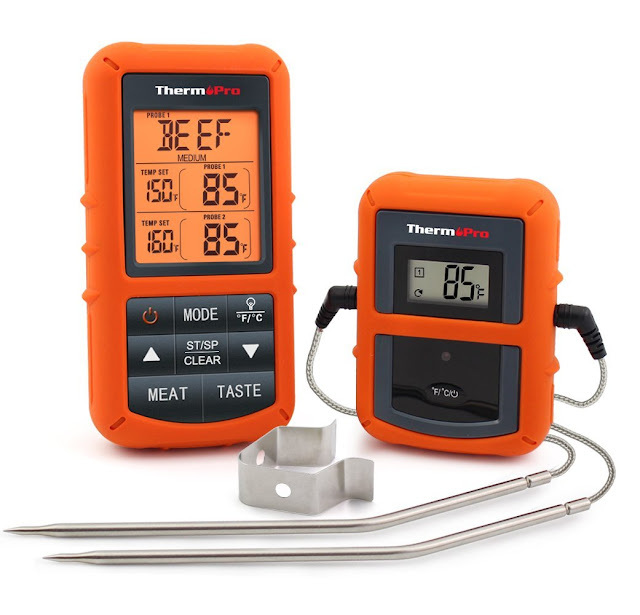 Thermopro tp20 is a dual probe thermometer so that you may enjoy two types of cooking at the same time.So, you have flexibility and freedom to use your thermometer for two types of cooking simultaneously because of it's dual probe functionality. Overall design and build quality of thermopro thermometer seems to be fantastic and you get your cooking thermometer which now a days has become an essential arsenal of your kitchen at a very reasonable price. It's easy to click buttons and back-lit design and rubber case material is all because of the heat propagation while you cook your food. So, your safety has been kept in mind when designing thermopro tp20 thermometer. Thermopro tp20 units are already synced so you don't have to synced them and to worry about messy set ups. Wireless range of thermopro tp20 is up to 300 feet which is a huge feature of this valuable thermometer. It means you can monitor your cooking while spending your time in enhancing your productivity, watching TV or doing your other works. 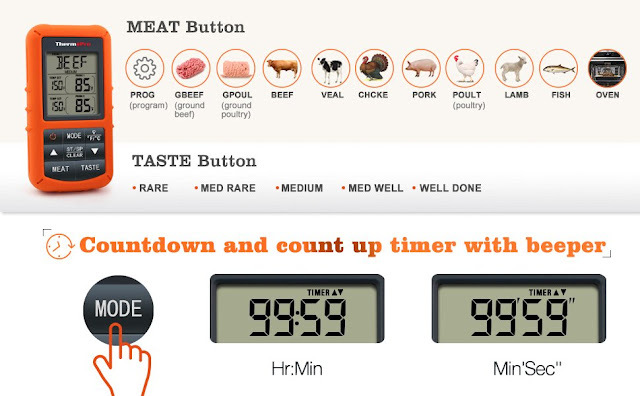 So now you have freedom to mingle with your friends and family while thermopro will monitor your cooking. This gives you a dedicated receiver using radio frequency for live temperature monitoring. Thermopro tp20 thermometer comes with life time sensor probe warranty. 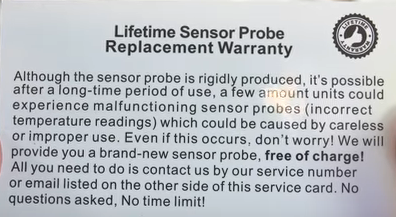 So, in case, if your sensor probe face any issues in future just call to customer support of I-Tronics and get your new sensor probe - no questions asked. 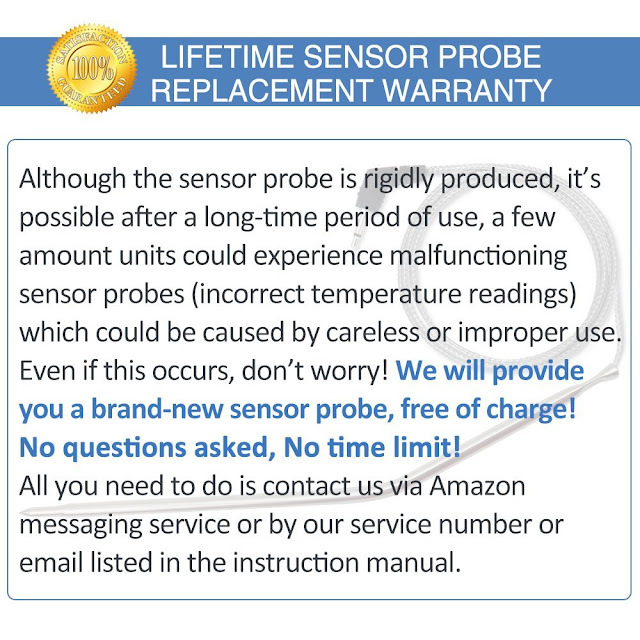 In order to claim for sensor probe, You can contact them through amazon or on the thermopro company website named as itronicsmall.com. 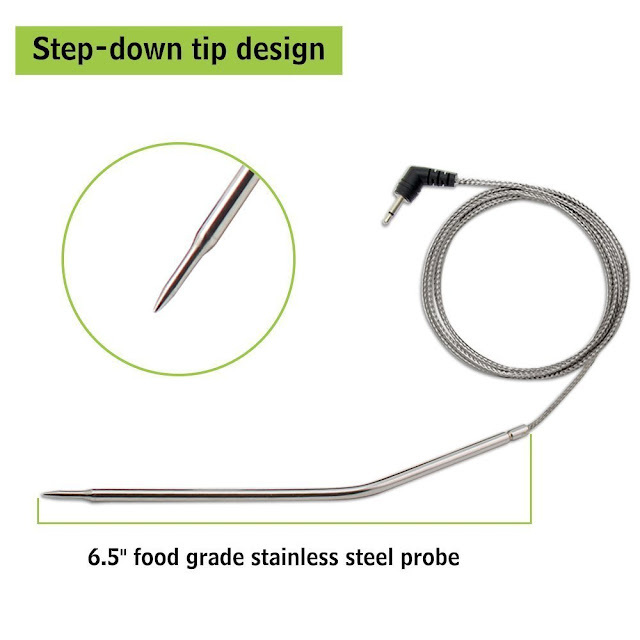 I wish there should be a color or number indicator on the probe so that we may easily detect that which probe is plugged in which port for easy probe handling. 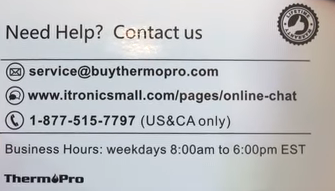 I hope thermopro will enhance this thermometer with my suggestion. Probe wires rates at 716 degrees F.
Product manual is a great thing to read first before using that product. This is not only the case for thermopro tp20 but with any product you buy. Product manual not only provide us detailed info about proper use of the product but also how to keep your product safe for longer time. I often come across customer reviews on amazon mentioning that they don't love product manuals as reading manuals feels them very boring. Whether it's boring or entertaining, it's very important for you to read at least once. There can be many useful info which you already don't have knowledge about. Beside this, there is also product safety instructions including where to keep your product and where to not. There are several methods to calibrate thermometers and you also have to calibrate meat thermometer differently as compared to grill thermometer. Calibration simply means the process of configuring an instrument to provide a result for a sample within an acceptable range. Calibration means to adjust, check or determine by comparison with a standard, the graduations of a quantitative measuring instrument, whether it's meat thermometer or grill thermometer. Sometimes, you need to make corrections in your thermometer to keep it reading the temperature correctly at all times. Do you know about maverick thermometers? Maverick is a pioneer in food thermometers but now a days thermopro is doing best in manufacturing best low priced excellent kind of food thermometers.This would not be wrong to say that thermopro have proved to be very authentic food thermometers source and has become a competitor of maverick. Thermopro tp08 is another one of the best selling low priced thermometer in thermopro thermometers series. Thermopro tp-08 provides you almost all the functionalities you get with tp20 but with minor differences. 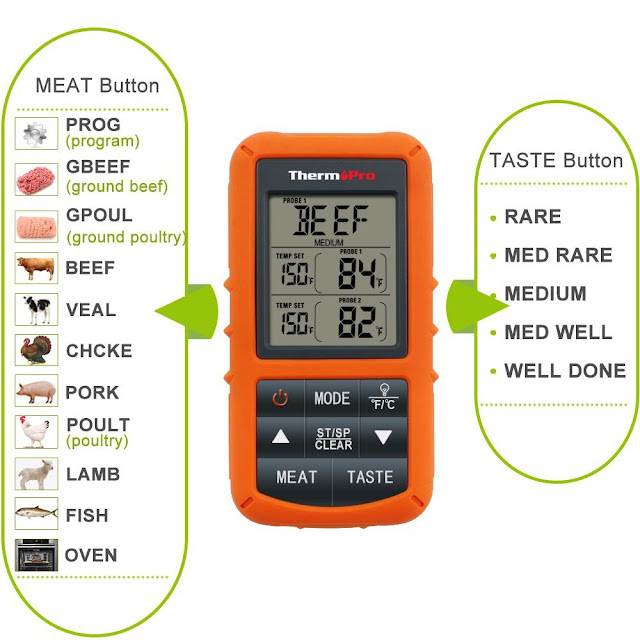 Although, Thermopro tp20 is one of the best reasonable priced meat food wireless remote thermometer but if you have some troubles by using it or don't like it because of any reasons then we have best thermopro tp20 alternatives for you to consider. One of the best alternative you should consider against thermopro tp20 thermometer is a newly released thermopro tp22 thermometer which has suitable and modern design. If you are seeking for low priced tp20 alternative then thermopro tp08 is best suggested low priced thermopro thermometer which seems to be same as like of tp20 with minor differences. But if for any reason, you don't want to consider thermopro thermometers and seeking thermometer from another company then Maverick et 733 thermometer is best alternative to thermopro tp20 thermometer. 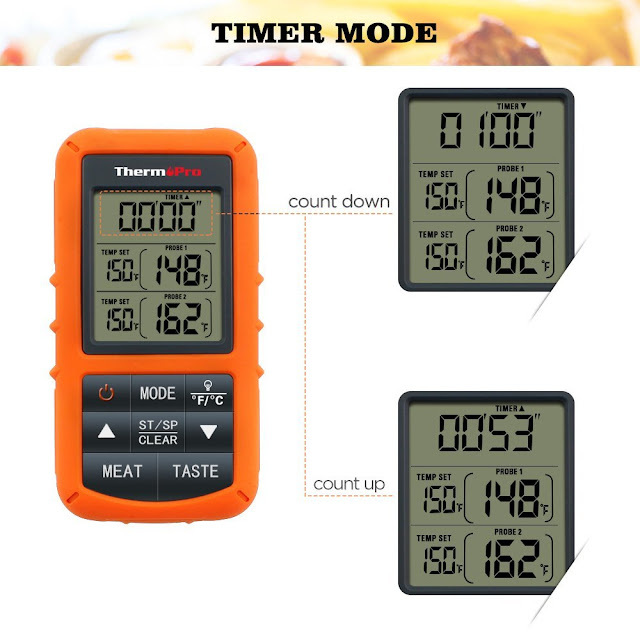 Overall, Thermopro TP20 thermometer is a great thermometer for busy griller. Receiver stand and belt clip are some of the best things which gives it something extra over other wireless meat food thermometers. Accuracy and options of thermopro tp20 are no doubt top quality. Both probes have no numbering or coloring option which is a bit of downer for thermopro tp20. Overall thermopro tp20 is a good buy with a company having best customer support who will help you with any problems you have which in itself makes it a worthy purchase. I hope this thermopro tp20 review will help you to make decision whether this is a best suited thermometer for you or not. Beside this, you can consider tp20 alternatives during your tp20 buying process. As always, if you or someone from you family or friends is seeking for valuable info regarding food thermometers then please share this website and specially this article with them. It's our humble request to share this article to best targeted cooking, grilling community and friends to take most of this article. If you have any valuable suggestion for this review, or have published your own review and want to comment on this blog, please contact us. We always welcome your input.